Dicynodontia is a taxon of anomodont therapsids or synapsids with beginnings in the mid-Permian, which were dominant in the Late Permian and continued throughout the Triassic, with a few possibly surviving into the Early Cretaceous. Dicynodonts were herbivorous animals with two tusks, hence their name, which means 'two dog tooth'. They are also the most successful and diverse of the non-mammalian therapsids, with over 70 genera known, varying from rat- to ox-sized. 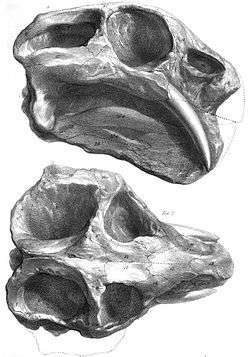 The dicynodont skull is highly specialised, light but strong, with the synapsid temporal openings at the rear of the skull greatly enlarged to accommodate larger jaw muscles. The front of the skull and the lower jaw are generally narrow and, in all but a number of primitive forms, toothless. Instead, the front of the mouth is equipped with a horny beak, as in turtles and ceratopsian dinosaurs. Food was processed by the retraction of the lower jaw when the mouth closed, producing a powerful shearing action, which would have enabled dicynodonts to cope with tough plant material. Many genera also have a pair of tusks, which it is thought may have been an example of sexual dimorphism. The body is short, strong and barrel-shaped, with strong limbs. In large genera (such as Dinodontosaurus) the hindlimbs were held erect, but the forelimbs bent at the elbow. Both the pectoral girdle and the ilium are large and strong. The tail is short. Dicynodonts have long been suspected of being warm-blooded animals. Their bones are highly vascularised, possess Haversian canals and their bodily proportions are conductive to heat preservation. In young specimens, the bones are so highly vascularised that they exhibit higher channel densities than most other therapsids. Yet, studies on Late Triassic dicynodont coprolites paradoxically showcase digestive patterns more typical of animals with slow metabolisms. More recently, the discovery of hair remnants in Permian coprolites possibly vindicates the status of dicynodonts as endothermic animals. As these coprolites come from carnivorous species and digested dicynodont bones are abundant, it has been suggested that at least some of these hair remnants come from dicynodont prey. An illustration of the skull of Dicynodon lacerticeps, first published in an 1845 description by Richard Owen. Dicynodonts have been known since the mid-1800s. The South African geologist Andrew Geddes Bain gave the first description of dicynodonts in 1845. At the time, Bain was a supervisor for the construction of military roads under the Corps of Royal Engineers and had found many reptilian fossils during his surveys of South Africa. Bain described these fossils in an 1845 letter published in Transactions of the Geological Society of London, calling them "bidentals" for their two prominent tusks. In that same year, the English paleontologist Richard Owen named two species of dicynodonts from South Africa: Dicynodon lacerticeps and Dicynodon bainii. Since Bain was preoccupied with the Corps of Royal Engineers, he wanted Owen to describe his fossils more extensively. Owen did not publish a description until 1876 in his Descriptive and Illustrated Catalogue of the Fossil Reptilia of South Africa in the Collection of the British Museum. By this time, many more dicynodonts had been described. In 1859, another important species called Ptychognathus declivis was named from South Africa. A year later, in 1860, Owen named the group Dicynodontia. In his Descriptive and Illustrated Catalogue, Owen honored Bain by erecting Bidentalia as a replacement name for his Dicynodontia. The name Bidentalia quickly fell out of use in the following years, replaced by popularity of Owen's Dicynodontia. Dicynodonts first appear during Middle Permian, and underwent a rapid evolutionary radiation, becoming the most successful and abundant land vertebrates of the Late Permian. During this time, they included a large variety of ecotypes, including large, medium-sized, and small herbivores and short-limbed mole-like burrowers. Only four lineages are known to have survived the end of Permian extinction; the first three represented with a single genus each; Myosaurus, Kombuisia and Lystrosaurus, the latter being the most common and widespread herbivores of the Induan (earliest Triassic). None of these survived long into the Triassic. The fourth group was the Kannemeyeriiformes, the only dicynodonts who diversified during the Triassic. These stocky, pig- to ox-sized animals were the most abundant herbivores worldwide from the Olenekian to the Ladinian age. By the Carnian they had been supplanted by traversodont cynodonts and rhynchosaur reptiles. During the Norian (middle of the Late Triassic), perhaps due to increasing aridity, they drastically declined, and the role of large herbivore was taken over by sauropodomorph dinosaurs. Fossils discovered in Poland indicate that dicynodonts survived at least until the early Rhaetian (latest Triassic). Six fragments of fossil bone interpreted as remains of a skull discovered in Australia (Queensland) might indicate that dicynodonts survived into the Cretaceous in southern Gondwana. However, Agnolin et al. (2010) considered the affinities of the specimen from Australia to be uncertain, and noted its similarity to the skull bones of some baurusuchian crocodyliforms, such as Baurusuchus pachecoi. With the decline and extinction of the kannemeyerids, there were to be no more dominant large synapsid herbivores until the middle Paleocene epoch (60 Ma) when mammals, descendants of cynodonts, began to diversify after the extinction of the dinosaurs. Dicynodontia was originally named by the English paleontologist Richard Owen. It was erected as a family of the order Anomodontia and included the genera Dicynodon and Ptychognathus. 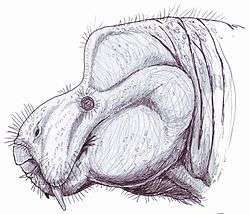 Other families of Anomodontia included Gnathodontia, which included Rhynchosaurus (now known to be an archosauromorph) and Cryptodontia, which included Oudenodon. Cryptodonts were distinguished from dicynodonts from their absence of tusks. 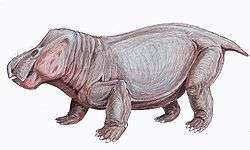 Although it lacks tusks, Oudenodon is now classified as a dicynodont, and the name Cryptodontia is no longer used. Thomas Henry Huxley revised Owen's Dicynodontia as an order that included Dicynodon and Oudenodon. Dicynodontia was later ranked as a suborder or infraorder with the larger group Anomodontia, which is classified as an order. The ranking of Dicynodontia has varied in recent studies, with Ivakhnenko (2008) considering it a suborder, Ivanchnenko (2008) considering it an infraorder, and Kurkin (2010) considering it an order. Many higher taxa, including infraorders and families, have been erected as a means of classifying the large number of dicynodont species. Cluver and King (1983) recognized several main groups within Dicynodontia, including Diictodontia, Endothiodontia, Eodicynodontia, Kingoriamorpha, Pristerodontia, and Venyukoviamorpha. Many families have been proposed, including Cistecephalidae, Diictodontidae, Dicynodontidae, Emydopidae, Endothiodontidae, Kannemeyeriidae, Kingoriidae, Lystrosauridae, Myosauridae, Oudenodontidae, Pristerodontidae, and Robertiidae. However, with the rise of phylogenetics, most of these taxa are no longer considered valid. Kammerer and Angielczyk (2009) suggested that the problematic taxonomy and nomenclature of Dicynodontia and other groups results from the large number of conflicting studies and the tendency for invalid names to be mistakenly established. 1 2 Thulborn, T.; Turner, S. (2003). "The last dicynodont: an Australian Cretaceous relict". Proceedings of the Royal Society B: Biological Sciences. 270 (1518): 985–993. doi:10.1098/rspb.2002.2296. JSTOR 3558635. ↑ Bain, A.G. (1845). "On the discovery of fossil remains of bidental and other reptiles in South Africa". Transactions of the Geological Society of London. 1: 53–59. doi:10.1144/GSL.JGS.1845.001.01.72. 1 2 Owen, R. (1876). Descriptive and Illustrated Catalogue of the Fossil Reptilia of South Africa in the Collection of the British Museum. London: British Museum. p. 88. ↑ Owen, R. (1860). "On the orders of fossil and recent Reptilia, and their distribution in time". Report of the Twenty-Ninth Meeting of the British Association for the Advancement of Science. 1859: 153–166. 1 2 Kammerer, C.F. ; Angielczyk, K.D. (2009). "A proposed higher taxonomy of anomodont therapsids" (PDF). Zootaxa. 2018: 1–24. ↑ Agnolin, F. L.; Ezcurra, M. D.; Pais, D. F.; Salisbury, S. W. (2010). "A reappraisal of the Cretaceous non-avian dinosaur faunas from Australia and New Zealand: Evidence for their Gondwanan affinities". Journal of Systematic Palaeontology. 8 (2): 257–300. doi:10.1080/14772011003594870. ↑ Osborn, H.F. (1904). "Reclassification of the Reptilia". The American Naturalist. 38 (446): 93–115. doi:10.1086/278383. ↑ Kurkin, A.A. (2010). "Late Permian dicynodonts of Eastern Europe". Paleontological Journal. 44 (6): 72–80. doi:10.1134/S0031030110060092. ↑ Cluver, M.A. ; King, G.M. (1983). "A reassessment of the relationships of Permian Dicynodontia (Reptilia, Therapsida) and a new classification of dicynodont". Annals of the South African Museum. 91: 195–273. ↑ Kenneth D. Angielczyk; Bruce S. Rubidge (2010). "A new pylaecephalid dicynodont (Therapsida, Anomodontia) from the Tapinocephalus Assemblage Zone, Karoo Basin, Middle Permian of South Africa". Journal of Vertebrate Paleontology. 30 (5): 1396–1409. doi:10.1080/02724634.2010.501447.